A crocheted scarf is one of the easiest items to crochet as a gift for someone and some of the more popular scarf items to crochet are infinity scarves, cowls, and scarves with hoods on them. There are several methods and stitches that can be used to make these items and they can be made for men, women and kids in a variety of yarns and colors. An easy scarf to make it to use basic single or double crochet and crochet a scarf as long or as short as you want. An infinity scarf is a longer scarf that is crocheted in a circle or long length and worn on the neck in a circular fashion. While a cowl is a shorter version of the infinity or more like a collar worn to keep a neck warm. Scarves with added hoods make a scarf more universal to wear when you also need a hat. Infinity scarves and cowls can also me worn indoors to keep warm or to dress up an outfit. When crocheting one of these scarves be sure to select the right yarn for the project to keep your subject warm or make them look fashionable with a sweater or top. Crochet a Skylark Scarf - A crocheted scarf that is made on an angle so that can be worn in many different ways. Chunky Ribbed Scarf Pattern - An easy scarf to crochet for beginners that looks great on men or women crocheted in the back loops to give it a ribbed look. Elegant Infinity Scarf - A simple but elegant scarf crocheted in two different color combinations. Lacy Scarf Crochet Pattern - The large gaps in this pattern give the scarf a lacy look. Moebius Cowl Chunky Version - Made using a thicker chunky yarn or two strands of yarn held together give this cowl a different unique look. First Love Cowl - A Super easy cowl to crochet for a beginner. Black and White Infinity scarf pattern - This scarf looks great in many different colors including the black and white theme and is a great gift for men or women. Hooded Scarf Pattern - A pattern made to wear for the head and neck all combined into one. This scarf is sure to keep you warm! Chevron Infinity Scarf - An infinity scarf made using the chevron pattern. 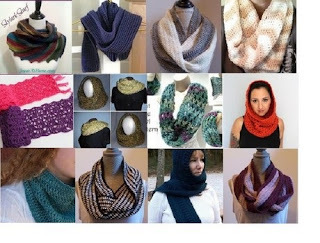 There are so many wonderful free scarf, cowl, and infinity scarves to crochet that can be found online here are a few more of the free patterns you can download and start crocheting right away. View more free scarf and cowl patterns to crochet here.